Thanks to nearly non-stop coverage of an historic inauguration held amid major foreign and domestic crises, the new Obama administration dominated the news agenda last week, overwhelming every other story. Coverage of Obama’s transformation from President-elect to President filled 45% of the time on TV and radio and space in print and online the week of Jan. 19-25, as measured by the News Coverage Index from the Pew Research Center’s Project for Excellence in Journalism. This made it the biggest weekly story since the voters went to the polls on Nov. 4. Last week’s news landscape also interrupted a recent pattern of more diverse and diffuse coverage. In the weeks following the election, the media’s attention had been fairly evenly divided among a number of top stories—including the Obama transition, the financial crisis, the Rod Blagojevich scandal and the fighting in Gaza. By contrast, Obama’s ascendance to the Oval Office last week generated three times as much coverage as the No. 2 story—the continuing, if not worsening, economic meltdown, which filled 15% of the newshole. The only other story to generate any really substantial coverage was about U.S. efforts to combat terror, at 8% of the newshole. And it’s worth noting that the new President was a significant factor in both the economic story, by virtue of his pushing for a stimulus package, and in the terrorism story, fueled to a large degree by his decision to eventually close the Guantanamo facility. In another indication of how fully the new President overwhelmed the news, Obama was a lead newsmaker—a designation for someone featured in at least 50% of a story—in almost one-third of all the stories analyzed by the PEJ last week. While it’s unrealistic to expect Obama to continue to generate that level of attention, the degree of public and media interest combined with the daunting challenges facing the new President suggest he will be the main driver of the news narrative in the foreseeable future. By far, the leading storyline in the coverage of the Obama administration last week, filling about half of that newshole studied, was the pomp and circumstance of the inauguration itself. But that was a multi-layered narrative that involved everything from the logistics of handling two million live spectators to the extensive analysis of his inaugural address. Nearly every conceivable angle seemed to generate attention. On inauguration day, the Wall Street Journal found a creative way of reporting the logistics story by profiling Emmett Beliveau, the 32-year old executive director of the Presidential Inaugural Committee, who was responsible for “overseeing the 5,000 portable toilets plus 20 Jumbotron television screens, hundreds of shuttle buses, thousands of VIPs, the distribution of event tickets by armored truck, and what the Obama staff calls ‘chum’—trinkets being peddled to the masses.” Beliveau’s many duties covered everything from the performance of Challenger the bald eagle at the Lincoln Memorial concert to procuring tickets for Leonardo DiCaprio, who was jetting in last minute from London. Once Obama took the oath of office, much of the coverage was devoted to painstaking analysis of his speech. That media commentary focused most notably on two aspects—a repudiation of the policies of George Bush (who happened to be sitting only feet away) and a serious tone largely bereft of crowd-thrilling rhetorical flourishes. The press was also quick to seize on any potential gaffes. One such unexpected wrinkle to get sizable attention was the botched oath of office administered by Supreme Court Chief Justice John Roberts, followed by a quiet do-over the next day in the White House. If the inauguration was top storyline, the second-biggest component of coverage of the new President focused on his first few days, which were marked by a wave of announcements and decisions designed to create a sense of momentum with the public and media. Perhaps because Obama had been far more vocal about economic policy than foreign policy during the transition period—falling back on his “one President at a time” line—there seemed to be heightened press interest in his post-inaugural moves on the diplomatic front. “President Barack Obama named special envoys on Thursday for the long-troubled Middle East and the violent Afghanistan-Pakistan region and promised U.S. help in ensuring a lasting truce in Gaza,” noted a Jan. 22 Reuters report on his selection of former Senator George Mitchell and ex-UN Ambassador Richard Holbrooke as U.S. trouble shooters in two of the world’s hottest flashpoints. Commentary, such as Buchanan’s, that made assessments and predictions about the new President’s priorities filled another chunk—roughly one-tenth—of the coverage last week. Presidential-centric punditry may well grow louder in the coming weeks, most notably in the cable and talk radio media echo chambers. A distant second in the coverage, the financial crisis filled 15% of the newshole in the week of Jan. 19-25. That is a level fairly consistent with recent weeks. Last week, roughly one-third of the meltdown narrative was about the proposed stimulus package that Obama is trying to get passed, the politics and elements of the plan. In his story on the new President’s meeting with Congressional leaders for the Jan. 23 ABC newscast, correspondent Jake Tapper reported that “in that hour-long meeting, President Obama told the group that if this doesn’t pass, we may lose our jobs. But none of that’s gonna matter because the economy will be in a major crisis and the American people will be truly hurting.” The theme of the story was Obama’s growing pressure on legislators to pass the plan, a dynamic tempered by some Republican objections aired in the piece. A very different angle to the economic meltdown story last week involved former Merrill Lynch CEO John Thain’s departure from the Bank of America “after reports he rushed out billions of dollars in bonuses to Merrill Lynch employees in his final days as CEO there, while the brokerage was suffering huge losses and just before Bank of America took it over,” according to an AP story. Thain became an even bigger symbol of outrageous extravagance when financial cable channel CNBC reported he spent more than $1 million to refurbish his Merrill Lynch office suite—including $87,784 on a rug, $68,179 on a credenza and $25,713 on a pedestal table. Many on Wall Street, including Thain, have fallen off their pedestals since Lehman Bros. went belly up in September. 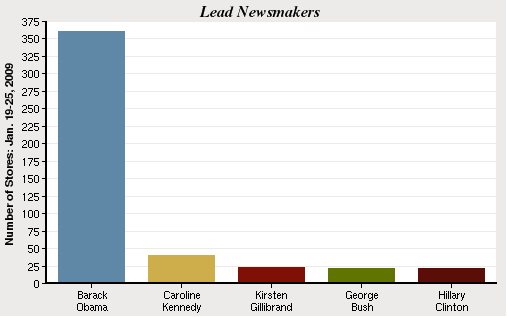 Obama easily lapped the field last week, showing up in as a lead newsmaker in 30% of the stories examined. What’s more surprising is the No. 2 newsmaker, even though she accounted for only about one-tenth as much coverage as Obama. Caroline Kennedy’s mysterious decision to withdraw her name from consideration to fill Hillary Clinton’s Senate seat triggered a moderate media frenzy, particularly among the New York tabloids, with rumors, speculation and leaks running rampant. It might have been even bigger, and the guessing even more wild, had it come another week. The No. 3 newsmaker was the little-known upstate New York Congresswoman who was actually selected to succeed Clinton, Kirsten Gillibrand. She was followed by outgoing President George Bush at No. 4, who disappeared remarkably quickly. He was a lead newsmaker in only 2% of the stories. Next came newly minted Secretary of State Hillary Clinton—who arrived on the job on Jan. 22 to a rousing welcome from hundreds of cheering employees in Foggy Bottom. After the new administration and the financial crisis, the third-biggest story from Jan. 19-25—at 8% of the newshole—was U.S. policy on terrorism, a narrative dominated by Obama’s decision to eventually close the prison at Guantanamo Bay in Cuba. That was followed by coverage of the new Congress (5%), where the big news was that Kirsten Gillibrand, not Caroline Kennedy, would be New York’s new junior Senator. The No. 5 story (4%) was the Israeli-Palestinian conflict, most notably, the cease-fire that brought at least a temporary end to the Gaza bloodshed. With the violence easing, coverage was down markedly from a conflict that filled 21% and 17% of the newshole in the first weeks of fighting. The bottom half of last week’s top-10 story roster included coverage of George Bush’s last days in office (2%) followed by stories that focused on the racial and global impact of Obama’s Nov. 4 victory (also at 2%). The National Football league playoffs, in the run-up to the Super Bowl, was No. 8, at 1% of the newshole. Next was coverage of the Jan. 19 Martin Luther King holiday (1%) and at No. 10, coverage of the situation inside Iraq, (1%) with an emphasis on the upcoming provincial elections.